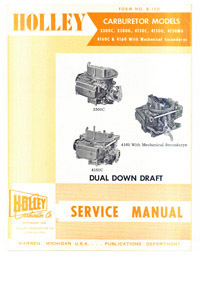 Detailed service manual: Complete factory service information for Holley model 2300 carburetors used on 1959-1965 American Motors, 1957-1971 Ford, 1958-1970 International and 1960-1961 Lincoln applications. Includes detailed service and adjustment information. Also features adjustments for Ford 406 CID 6V set ups. Fast, secure e-book download.